The Disney – Minnie Mouse 4-Piece Toddler Bedding Set comes with a comforter, top sheet, fitted sheet and pillowcase, all featuring bright colors and a cheery Minnie Mouse design that is sure to brighten any girl’s room! The comforter is 100 percent polyester microfiber with 100 percent polyester fiber filling, and the entire set is machine washable. Coordinating pieces are available and sold separately. 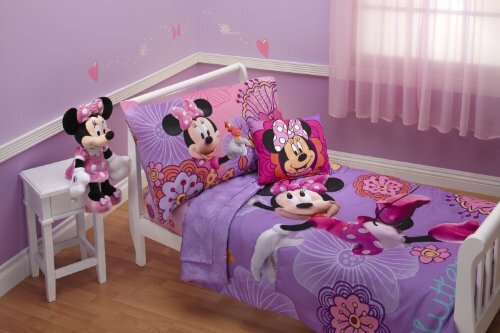 The Disney – Minnie Mouse 4-Piece Toddler Bedding Set comes with a comforter, top sheet, fitted sheet and pillowcase. The comforter is 100 percent polyester microfiber with 100 percent polyester fiber filling. The entire set is machine washable. Coordinating pieces are available and sold separately.